You might be knowing about the bulk import feature of Fedena which allows you to enter the data of all your students into Fedena from an excel sheet saved as csv. But how to prepare this excel sheet containing all the data of students, batches and other fields. If you are doing it manually, it will take more than one day to prepare the sheet. But if you trust your students/parents to input the data correctly, here is an easy method. You can use Google forms and create a spreadsheet which can be uploaded through Data Import. 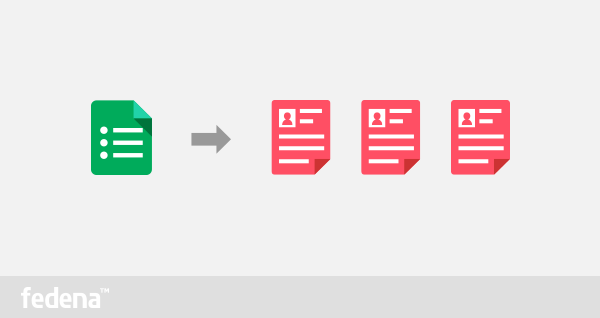 This article will give you a step-by-step description of how you can use Google forms to create Fedena bulk import CSV. We recommend you to watch the Google form introduction video before reading the following steps to understand the method better. Step 1: The first step requires you to login to your gmail account and go to ‘Drive’. Then, in ‘Drive’, click on to ‘Create’ and then ‘Forms’ to create the form with different items to send it to students to fill it. Step 2: You get an ‘Untitled form’ which you need to fill up with the necessary information. But first, you need to name the form and then proceed towards filling up necessary items. For example, we have named the form as ‘Admission 2013-2014’. You need to add ‘Description’, ‘Question title’, the ‘Help Text’ in case, you want to describe the ‘Question title’, the ‘Question type’ and then tick the ‘Required question’ if its an important field for students to answer. You can select from the different options available for ‘Question Type’ based on the kind of answer you want. Step 3: You can add many more items by clicking the ‘Add item’ bar under different item names like ‘Names’, ‘Blood Group’, ‘Date of birth’, ‘Gender’ and so on. It must be noted that with every item, the ‘Question Type’ for each will change accordingly. For example, when you choose something like ‘Blood Group’ or ‘Gender’, the Question type won’t be a Text bar. Instead, it can be something like checkboxes. Step 4: Once you are done filling up all the items you wanted, you have to send the form to the respected students by using the ‘Send form’ option at the bottom of the page. Or else, you can copy the link of the form from the tab and email it to the students. When they fill up the form, you will receive the filled up forms as responses. Step 5: To extract the responses in excel sheet, click on to ‘Choose response destination’ which gives you the option of getting all the information in one spreadsheet. All you need to do is to click on to ‘Create’. After the spreadsheet is created, you receive an option like ‘View responses’ which on selection, will give you the spreadsheet. Step 6: Once you have the completed spreadsheet, you can upload it to ‘Data Imports’. For this, you need to login to Fedena and go to ‘More’ in dashboard. After, you need to go to ‘Data Imports’ and upload the spreadsheet for the respective batch which you need to create first. Thus, all information related to new admission are stored in your system without much hustle. When you have advantages like this, why spend time in writing down each and every detail carefully. Change to Fedena and see the difference!